Everything Tasty from My Kitchen: Cauliflower Crust Pizza.....you won't believe it! Cauliflower Crust Pizza with onions and cheese. 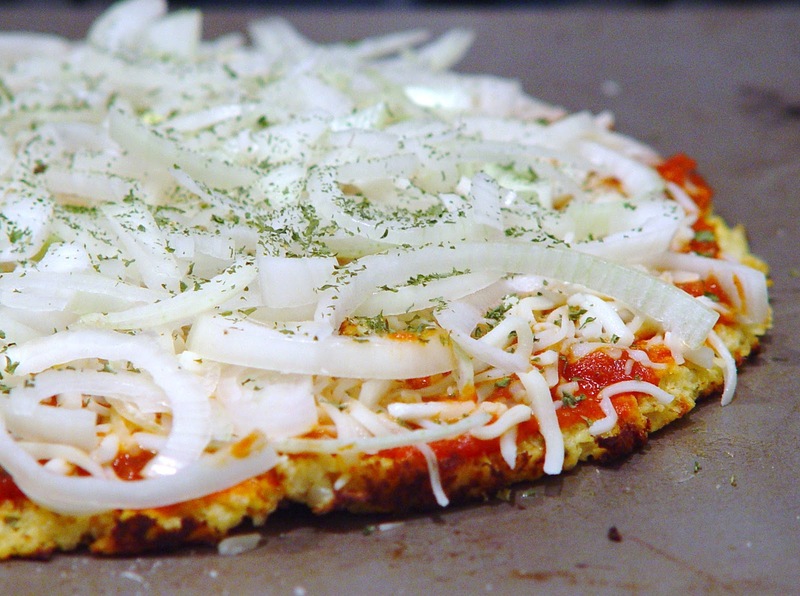 Yes, really.......this pizza was made with a cauliflower crust! I can't tell you how excited I am about this recipe. When I first saw this posted I thought the pizza looked so appetizing that I knew I had to give this a try. I was a little skeptical but only because I didn't want to get my hopes up. I'm always trying to cut out a few carbs and I'm always craving pizza. I had all the ingredients on hand so I was happy to whip up an onion pizza, my favorite! Well.... let-me-tell-you, this is surprisingly-unbelievably-amazingly good!!! Pizza night is officially back!!! 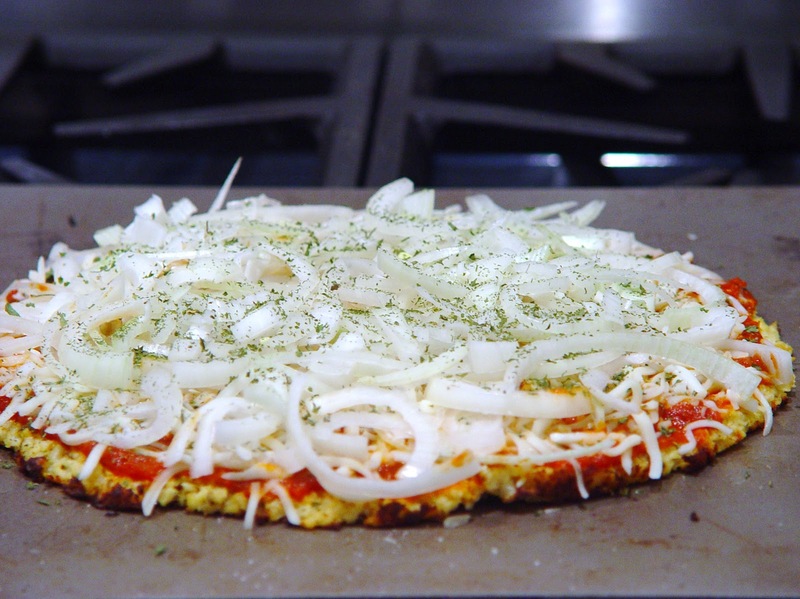 Cauliflower Crust Pizza....slices up beautifully. Break the cauliflower into floret's and use a food processor or cheese grater to shred the cauliflower into little bits. 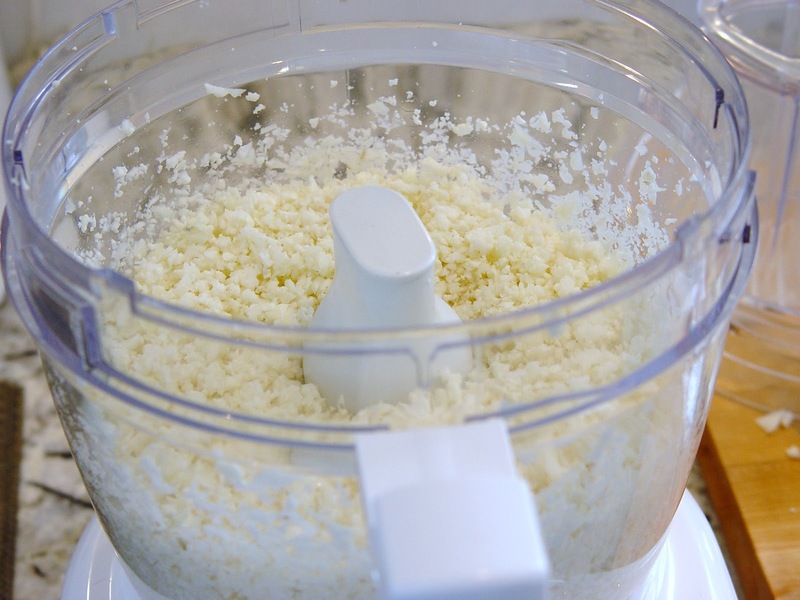 It takes about 10-12 pulses in the food processor to get the right consistency, being careful not to over process and make a puree. 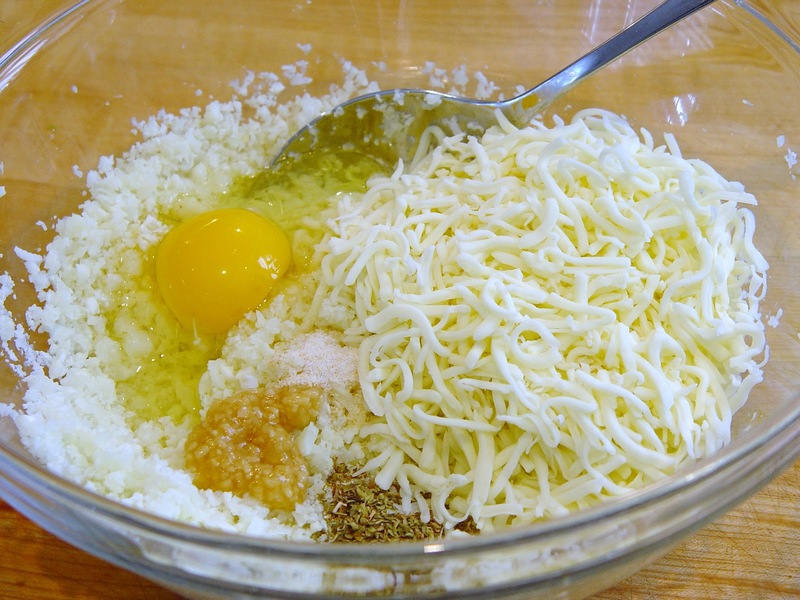 Transfer to a large bowl and cook in the microwave, uncovered, for 8 minutes on high heat. It is not necessary to add water, the cauliflower will steam on it's own. Let the cauliflower cool slightly and mix in all remaining crust ingredients. 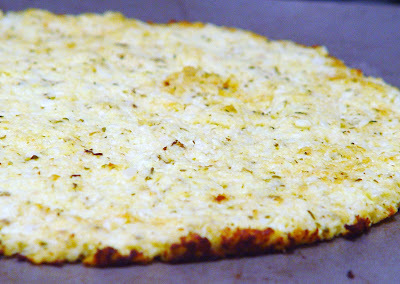 Spray a pizza pan or sheet pan with non-stick spray liberally and spread out the mixture. 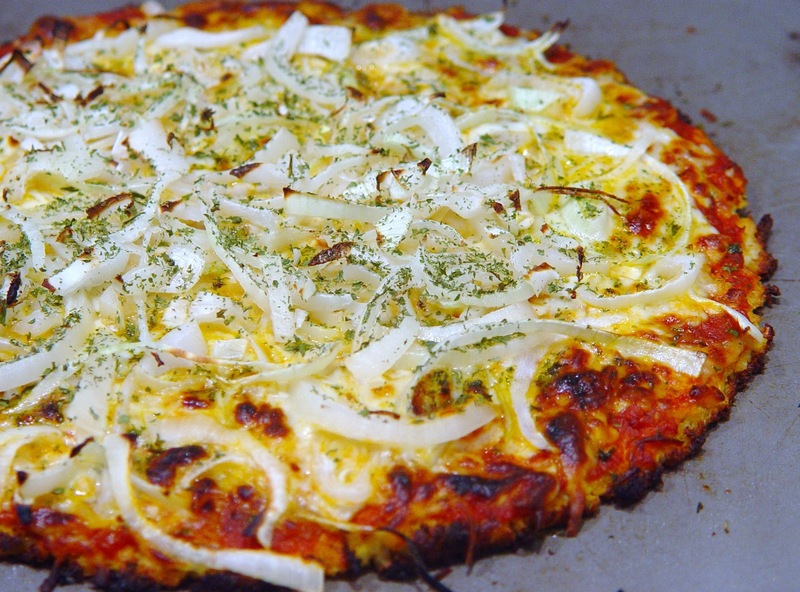 Go for a pretty thin pizza, this will ensure crispiness. Spray the top lightly with cooking spray. Place the crust in the oven and cook for 20 minutes. It will get crispy and dark in many areas. Important tip: before you top the crust with toppings, be sure to take a large spatula and very gently loosen the bottom of the crust from the pan. This will prevent it from sticking as you cook it further. 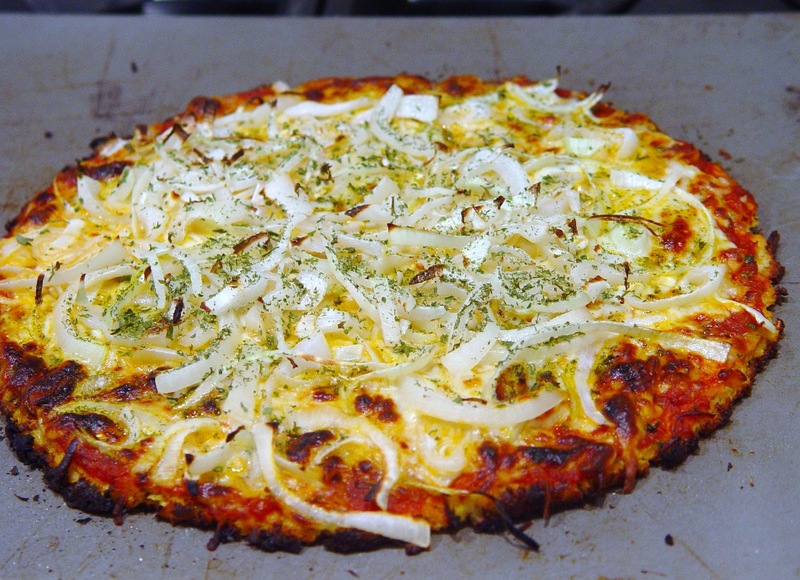 Top the crust with your favorite toppings and bake until cheese is melted, about 10-15 minutes, and turn on the broiler for 2-3 minutes to crisp the top to your liking. Pulse until little pebbles of cauliflower form. Than cook in the microwave. The consistency is easy to shape into a pizza. 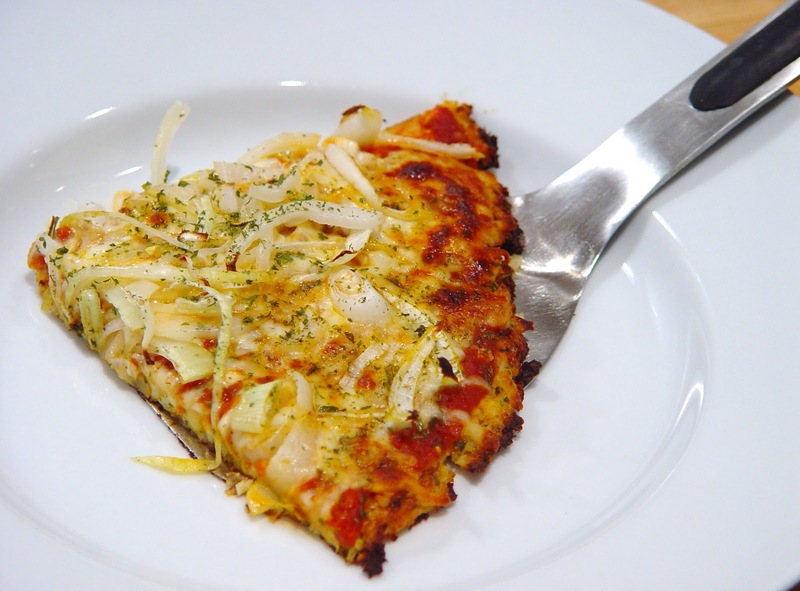 The bottom crust crisps up nicely and holds the pizza together. 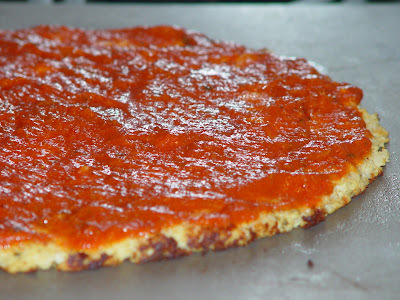 Spread the pizza thin or you will be eating it with a fork. Add your favorite toppings. I used mozzarella but sometimes I mix cheeses together. Onion Pizza with Cauliflower Crust ready for the oven. Hot out of the oven. This is absolutely delicious!!! This is so good reheated too! Check out all my tips and how my Margherita Cauliflower Crust Pizza came out! This looks like real pizza, I need to try this. Looks so delicious! Any ideas how I should heat if I don't have a microwave? 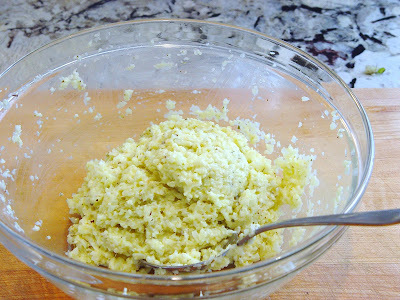 You can boil or steam the cauliflower. Fill a pot with 1.5 inches of water and boil the florets until fork tender, about 10-15 minutes. After this, you can rice the cauliflower into little pieces. I made this for dinner tonight and it was delicious! For sauce I used marinara from Trader Joes and for toppings I used slice zucchini, mushrooms, sliced tomatoes, some spinach and some fresh basil. Will definitely be making this again! Thank you so much for this great recipe.